One can see the relationship between the progression of human tools and human cognitive development throughout the epochs. Paleolithic stone tools provide a concrete evidence of major developments in human behavioral and cognitive evolution. In a research conducted by Stout, Passingham, Frith, Apel, and Chaminade (2011), the study revealed the relationship between evolving cognitive mechanisms and cultural transmission of increasing complex prehistoric technologies. 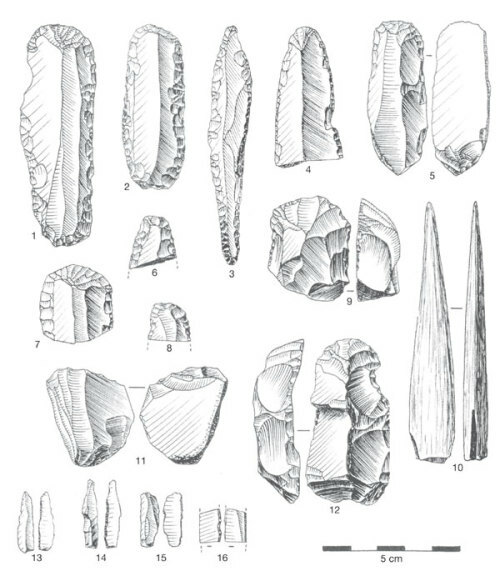 They examined the two ancient tool methods: the Oldowan method which was documented by the earliest type of tools created some 2.5 million years ago. The other tool method was the Acheulean method ,which was used some 500 thousand years ago. Subjects were asked to use the two different tools and their neural activity were documented in the process. Results showed that understanding of Acheulean toolmaking involves increased demands for the recognition of abstract technological intentions. The use of Acheulean toolmaking was associated with activation of left anterior intraparietal and inferior frontal sulci, indicating the relevance of resonance mechanisms (Stout et al, 2011). One notices that as human civilizations relied on technology for their survival, from the most basic tools , which was used to hunt and gather foods, to the use of technologies that were meant to expand societies. Technological advancements paralleled human social evolution, which required and relied on neural and cognitive mastery. One thing that I canâ€™t help but fathom is how we , as a people, have truly advanced. Ten thousand years ago, our ancestors were nomadic peoples living and relying on sedentary lifestyles and at the mercy of nature. Now, in our advances, man has the power to harness nuclear power and can literally generate power as strong as the sun to power entire cities, nations, and continents. hehe, working on my Doctoral Dissertation already, researching pa lagi, literature review stage pa.